Honda Motorcycle & Scooter India Pvt. 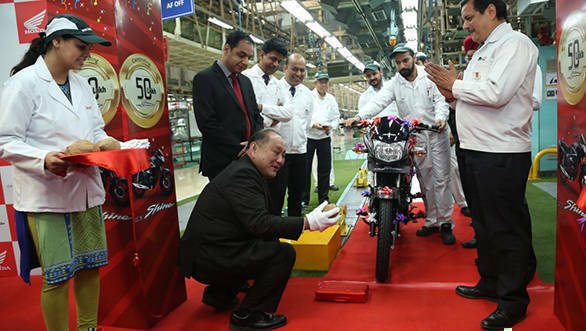 Ltd. (HMSI) has rolled out its 50th lakh CB Shine from its Tapukara plant in Rajasthan. 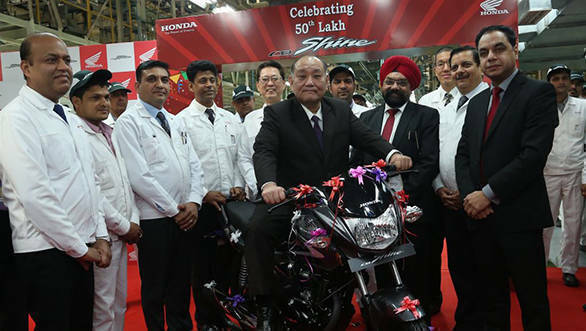 The CB Shine, as Honda claims, is the only 125cc motorcycle to cross 50 lakh sales mark. To celebrate, Honda has also launched the all-new 2017 BS-IV CB Shine with AHO. This new motorcycle is HMSI's third BS-IV compliant vehicle. The new CB Shine also comes in three variants - the self-drum-alloy at Rs 60,467, the self-disc-alloy at Rs 62,926 and the self-disc-alloy CBS at Rs 66,015 (ex-Mumbai). It gets merely a Rs 500-700 hike in price compared to the BS-III CB Shine. In addition to the BS-IV compliant engine, the CB Shine receives a few cosmetic as well as technical updates. The motorcycle is powered by a 124.73cc air-cooled, single-cylinder engine. The new CB Shine doesn't get any change in the power/torque rating. It generates the same 10.16PS at 7,500rpm and 10.30Nm at 5,500rpm. Even the claimed fuel efficiency is identical to the previous model's. Its cosmetic updates include a new chrome muffler, 3D emblem graphics on the tank, updated tail light design and a new chrome carburettor cover. The motorcycle is available in new athletic blue metallic and imperial red metallic colours.